When I first saw The Rock, I was mesmerised. It’s such a familiar sight, from a million photos, postcards and paintings, but in the flesh it has power. It is a deeper, darker red than the surrounding powdery pastel red desert sands. The shadows that fall where the rock folds are dark, almost blue. The Rock is much more complex, more textured than it appears in a two dimensional image. Close up it is a huge impassive presence. I listen, as if to hear its voice. I imagine it booms silently in the deepest bass. It vibrates with the deep throaty grumble of a didgeridoo, just outside of our hearing range. This monolith is full of curves and craters. It is ribbed. It is cloaked, draped with a soft red sandy velvet cloth. Huge empty pools wait for rain to fall, to fill and spill in giant stepped waterfalls. Water leaves its mark, dark stripes painting an image of a wet Uluru in dry times. 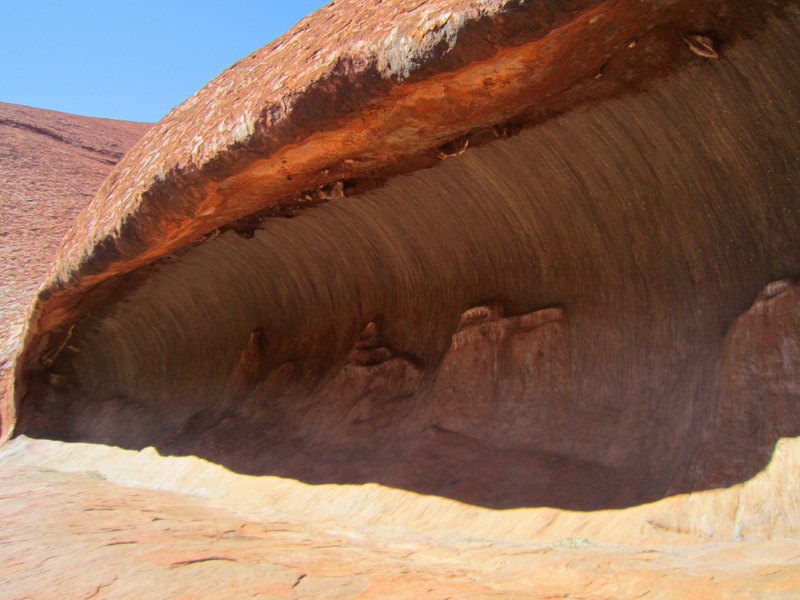 Uluru has caves, waves, an open mouth. It is honeycomb. Barbara Hepworth, the Cornish sculptress, comes into my mind. I see some of her curved stone shapes here, but her wildest dreams could not have imagined sculpting these forms and shapes on one piece of rock. It used to common for tourists to climb the rock. We look up, but do not see any tiny figures on this massive structure. The authorities have moved further and further towards a no climb policy. 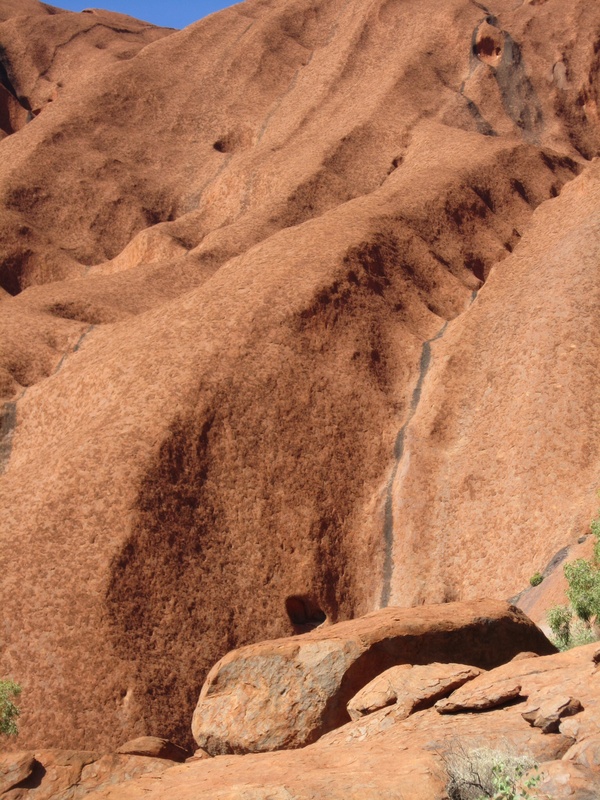 The fragile hand rail can be seen on the face of the rock, but the climb is closed. It is closed when it rains, when it is hot, when there is more than a 5% chance of a thunderstorm. Soon it will not be possible to climb at all. The Rock is sacred to the local indigenous people. It is right that we respect that. There are plaques in memory of those who lost their lives attempting the climb. It is better this way. 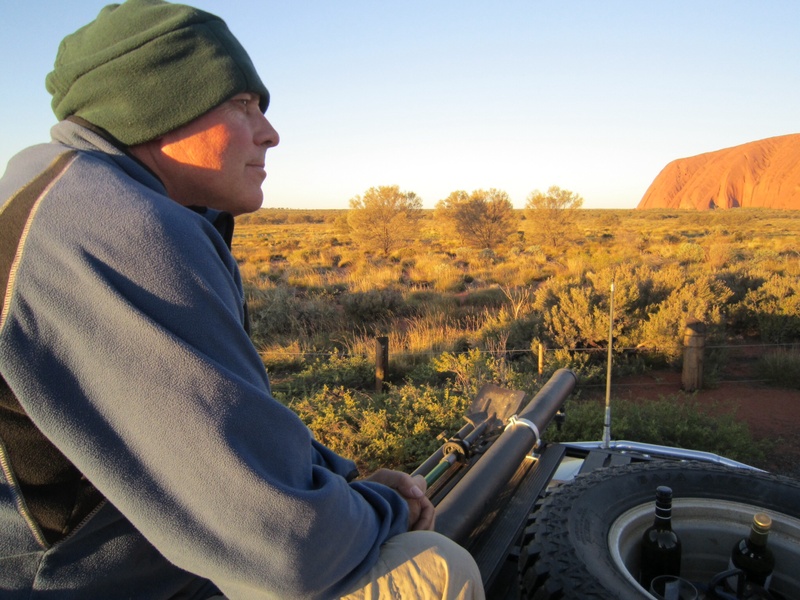 We sit on top of our roof top tent at the end of the day and watch the sunset play with the colours of The Rock. It glows golden with the dying light, then darkens to a burgundy blue. 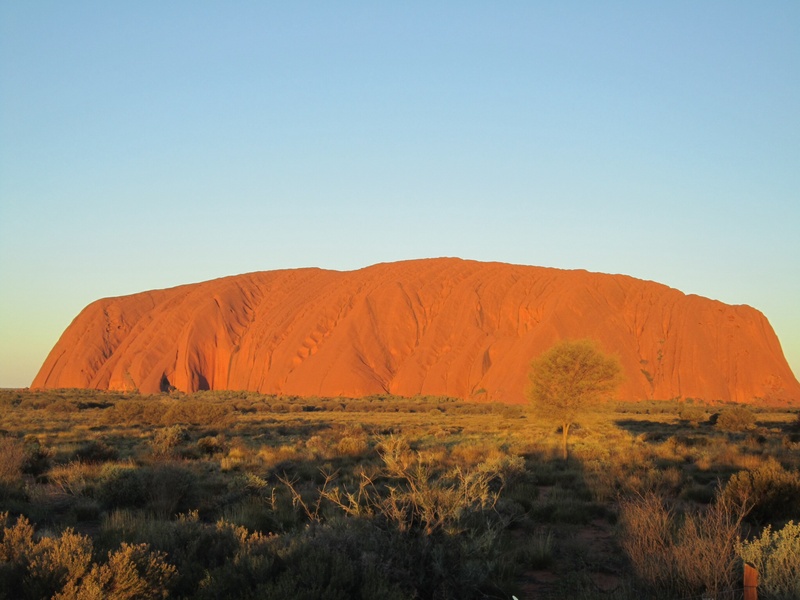 We raise a toast, “Uluru has power”, borrowing a line from a favourite John Williamson song. 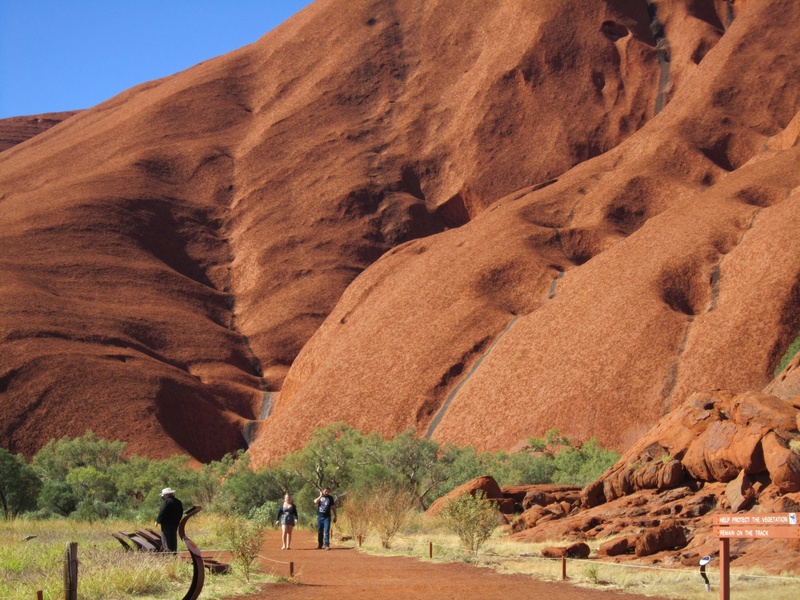 This entry was posted in Going home and tagged Australia, Ayers Rock, Outback, Travel, Uluru on 10/06/2014 by Deb McSephney.